The mass extinction of Australia’s giant animals, such as huge kangaroos and rhinoceros-sized wombats, might have been more rapid than previously thought, according to new research from the University of Bristol. This suggests humans could have been responsible for wiping out the country’s megafauna between 50,000 and 40,000 years ago. Working with researchers at the Australian National University (ANU) in Canberra, Dr Alistair Pike of Bristol’s Department of Archaeology and Anthropology analysed more than 60 megafauna bones and teeth found at Cuddie Springs in New South Wales. 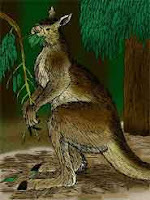 Cuddie Springs is central to the debate about the timing and cause of the megafaunal extinctions as it is the only site known in continental Australia where human artefacts and megafauna remains have been found in the same sedimentary layers. These layers have previously been dated to between about 40,000 and 30,000 years ago leading to speculation it was climate change that wiped out the megafauna. However, the megafauna remains had not been dated directly – until now. The researchers, led by Rainer Grün at the ANU, analysed the Cuddie Springs bones and teeth using uranium-series and electron spin resonance (ESR) dating techniques. Their results indicate that all the remains of the extinct species are at least 50,000 years old, and some are much older. This suggests there was not a long period of coexistence between the giant animals and early humans, and that Australia’s megafauna could have been rapidly hunted to extinction during the period (60,000-45,000 years ago) when the first humans reached the continent. Dr Pike said: “The cause of the disappearance of megafauna in Australia and also in Europe and North America is a hotly debated topic. Some researchers suggest it was climate change in the last ice age that caused their extinction, while others suggest it was overhunting by humans.